The year is 1984….after completing my apprenticeship in Typography and Design with the New Zealand Government Printing Office and working my way up to Senior Technical Officer I began to question the people and world around me. My thought process led me to deciding that by changing my circumstances this would be the source of my material happiness. I moved into the private sector working for various companies designing magazines and books but still felt that niggling splinter in the back of my mind. My next decision led me to playing music professionally in a band (started playing guitar at age 10)….I found myself busking in the street in Cuba St. Wellington during the day to maintain my ideal of making it with a local rock band. The place I frequented with my friend on Harmonica was by Krsna’s mercy the route the local devotees took for Harinama and I would watch them pass each day with books and prasadam. This caught my attention after awhile and one day a Srila Prabhupada disciple named Astasiddhi dasa approached and offered my a free book (the norm in those days) and a prasadam sweet ball. This continued each day as I collected all the books (my attraction was to the excellent printing quality). The books were proudly placed on my bookshelf for me to view from my bed. There they stayed until one day the guitarist from my band invited me to the Hare Krsna feast at the Lotus restaurant in Cuba St. We entered the small tight wooden staircase that led us endlessly (or what seemed to be endless) up to the top. I instantly felt a strong sense of spiritual energy as the chanting hit my ears and we sat and chanted the mantra along with the devotees and other guests. For some reason the name Rama struck me as something odd but I appreciated the strong vibration of the Holy names. After we feasted I felt an incredible spiritual surge running straight to my soul, I was very convinced that what I had been looking for all my life has finally manifested in the most unexpected way. From then on in I took great interest in devotional service and attended the temple for 2 days. At that time the yatra was recovering from a recent fall down of the zonal acarya so the devotees were not in good shape spiritually or sadhana wise. I found myself rising at 3.30am and chanting whilst the other ashram devotees slept in until 7am (only because Asta had come in from his house to wake them). During my first kirtan I felt an incredible surge again and just as the kirtan began warming up the sun broke through the temple room window right onto the middle of the kirtan which added more power to the experience. After that I went through a time of coming and going between my girlfriend and becoming a devotee. By the Lord’s mercy, I was awake one morning with my girlfriend next to me. 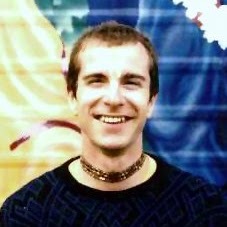 For some reason (inspiration from the supersoul) I switched on the radio and the announcer was talking about the weather and then incredibly he introduced a spiritual master from the Hare Krsna movement….that devotee was Prabhavisnu Swami whom I took initiation from in 1992 and 2 years later received Brahman initiation in Mayapur dhama. After this time I had established a tshirt printing business with my father under our house and we were getting contracts with his connections with the Department of Education. I then was inspired to start printing devotional t-shirts….Srila Prabhupada then the Maha mantra and finally a special shirt for the Auckland Rathayatra. One day whilst printing Srila Prabhupada’s shirt I got an overwhelming spiritual surge again and right at the point I decided in my mind “I don’t need to do anything else in life except become a devotee of Krsna”. It was a very powerful realisation and it affected me very strongly. I then thought to call the temple and discovered that they had recently moved to a location about 5 mins walk from my parents house! I visited there and met a very nice devotee and we moved into an apartment and he showed me the basics of sadhana and applying tilak etc. By the Lord’s mercy, a brahmacari band was visiting from Australia led by Ramai Swami so we decided to go to the feast and watch. At the end of the music and after the lecture, I became friendly with a very qualified devotee who is a true brahmana. We discussed my situation and after some time he came out with it “Why don’t you just leave New Zealand and join us in Australia on our travelling temple”. This was a bolt of lightening out of nowhere and I immediately accepted his offer and joined ISKCON officially in 1989 and travelled for 9 years travelling and organising hall preaching around Australia, playing guitar and drums in the Mantra Rock band.